The relationship between NZMPA and the Tertiary Providers and the place of the COMT course. NZMPA was the first organisation in NZ to provide post graduate training in manipulative therapy and for many years taught examined and graduated people with the Diploma of Manipulative Therapy (DipMT). This programme was superseded in the mid 90’s as the University programmes developed and the formal university qualifications of post graduate diplomas and Masters degrees emerged. To fill the gap between leaving undergraduate education and committing to university programmes NZMPA developed the College Accredited Membership (CAM) Courses. This was of value when the NZ College of Physiotherapy was functioning. When this route to college membership stopped NZMPA changed the course again to the current offering, the Certificate of Orthopaedic Manual Therapy (COMT). This current course is popular for a range of physiotherapists from new graduates to older more established therapist who want to keep up, to those returning to the work force after time out. The course is weekend based and is completed via nine weekends over two years. These courses are taught by experienced manual therapists all with post graduate qualification and strong affiliations with Auckland University of Technology and Otago University. The course assistants are all experienced clinicians. To foster and extend musculoskeletal diagnosis, management and clinical reasoning beyond the baseline undergraduate competencies. These weekend courses do not include assignments or practical examinations and the COMT is not a formally recognised qualification with the tertiary education frame work. 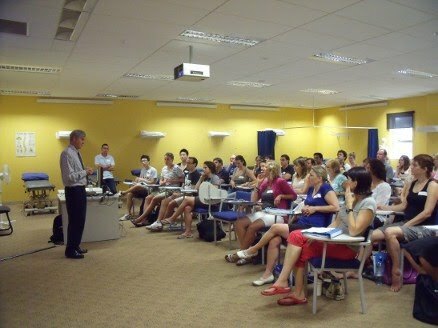 The course is for interest and self-advancement and clearly meets your CPD requirements for the NZ Physiotherapy Board. There is no formal credit for these courses if you wish to enter into a post graduate course at a University. What is different in the University courses? Whist the content of the techniques and lectures provided on the COMT course are similar to the university programmes, these programmes provide far greater depth of reading, 150 hours of supervised clinical practice, assignments and a practical examination. There are also other post graduate papers required to complete a post graduate diploma and masters degrees. The post graduate diploma programmes are also monitored and accredited by the International Federation of Orthopaedic Manipulative Therapists (IFOMPT). This makes the qualification international recognised and allow therapist to receive reciprocal recognitions with other countries who deliver IFOMPT accredited programmes. The COMT programme is not of that level. Therefore, if you are considering which way to go with our post graduate education you need to consider the end point. If you want a course that will extend your skills but is not a formal qualification then the COMT is for you. 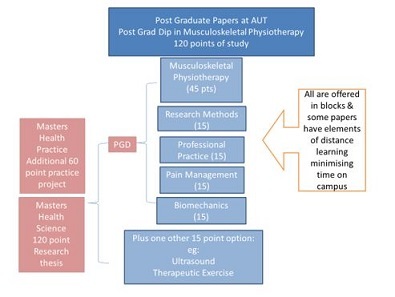 If you want an internationally recognised and accredited manual therapy qualification that is also part of the pathway to advanced practice and specialisation, then the university programmes are pathway for you. Please contact:On completing the relevant papers students can elect to have their degree endorsed in Orthopaedic Manipulative Therapy (OMT), or Sports Physiotherapy (Sports). Note that the above is not a complete summary of paper options, please contact us if you would like further details or have questions.